Just a few months ago the media was filled with headlines about the rise of anti-Semitism in Germany and the rest of Europe. Then in the past month the headlines switched to a quite different set of messages. A recent survey of 20,000 people in 20 countries found that Germany tops the USA as the world’s favorite country and just last week I learned that among 1800 cities, Berlin was named the most fun city in the world. The revelry over the 25 year anniversary of the fall of the Berlin Wall, trumpeting modern Germany’s free and democratic character, was an added flourish to the favorable image the media disseminated to global observers. How can we make sense from this hodgepodge stew of news bytes that yank our thoughts and feelings in such opposing directions? If we are living in a new dark era of danger, then why are global fun-seekers flocking to German bars, clubs, museums, and shops? Why do I continue to hear from readers who are eager to have their German citizenship restored? There have always been ebbs and flows of anti-Semitism and other forms of extremism in Germany and they naturally correlate with major events such as last summer’s Gaza conflict. But that does not mean that Jews in Germany face the same threats of persecution as in earlier eras or that, as Maxim Biller recently claimed in Tablet Magazine and Die Zeit, “all anti-Semitism is the same.” There is ample documentation that Germany has become a more tolerant society, such as one recent study which found that “acceptance of anti-Semitic statements….dropped significantly, from 8.6 to 3.2 percent.” Yes, it is a fragile tolerance that may become strained as a result of various social and economic pressures, but this is nothing unusual for an advanced democratic society. Sorting through the mixed messages from the media can be a challenge, which is why I tell people to come to Germany and see what it is like for themselves. Whether or not you decide Germany is your favorite country or Berlin is the most fun city in the world, you will probably have a lot of fun and find many reasons to celebrate. Stepping out into the steady downpour of rain this afternoon after a weekend of mostly errands and recovering from the first week of school, we nearly turned back before boarding the train. 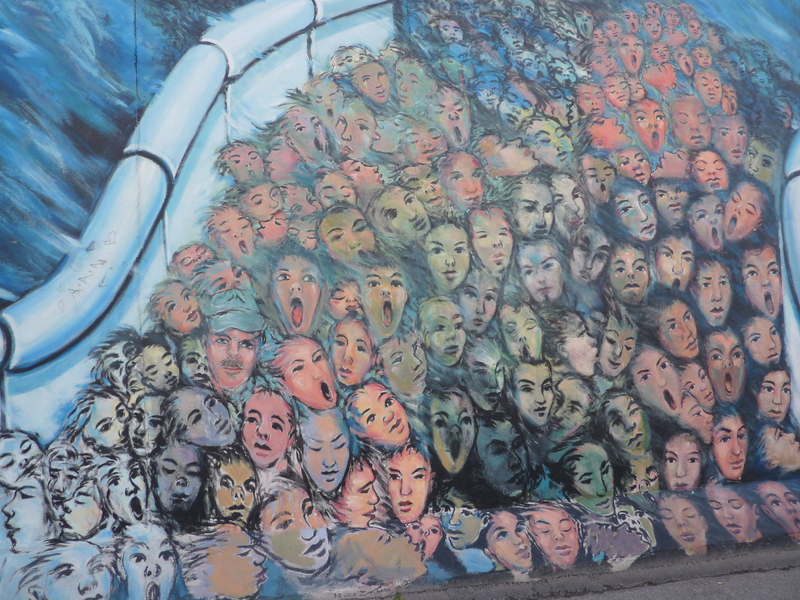 We were getting soaked and not sure that we would enjoy the experience at our intended destination: the East Side Gallery, a 1.3 km-long section that still remains of the Berlin Wall. But after a little flea market shopping in Friedrichshain and the best cappuccino and cake we’ve had since our arrival, the sun was shining, the air was crisp, and we headed over to the largest open air gallery in the world. The effect of the more than 100 paintings by artists from all over the world was breathtaking. 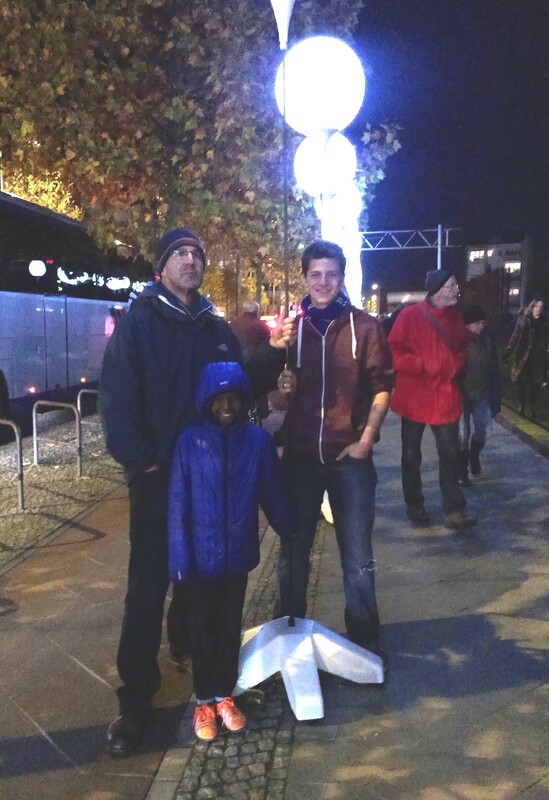 As an American living in Berlin I’ve felt a sense of liberation from the routine that my life had taken on as a working parent for the past 12 years. But my liberation of course pales in comparison to those who were liberated by the fall of the Berlin Wall in 1989. It was exhilarating to walk among the quietly smiling crowd of tourists who lined the wall and to see locals peacefully strolling along the Spree River that runs adjacent to the wall. The only note of sadness was the knowledge that this grand international memorial to freedom has stood for 20 years while many people around the world still live under conditions of oppression. Still, the powerful images that stand as a testament to the universal desire for freedom gave all of us a feeling of inspiration that will stay with us for a long time.